When Xiao Qiao receives damage, she can discard any heart hand card pass it to any other character in play. They then draws X cards, X being the total number of health points that the character is missing after the damage is passed. Xiao Qiao's "Beauty" allows her to discard card cards with a printed suit of spades to activate "Fantasy." 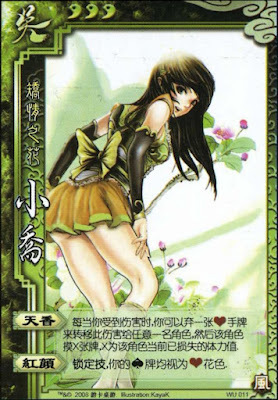 Xiao Qiao's "Beauty" extends to judgement cards. Her judgement cards that are spades are considered to be hearts. "Beauty" affects the Blaze tool card. When Xiao Qiao uses Blaze on another character and they show a heart, she can discard a heart or spade to damage them. Likewise, if the enemy shows a spade, Xiao Qiao will not be able to damage them. When Xiao Qiao uses "Fantasy," the source of the damage is not changed - the person who would have been responsible for Xiao Qiao taking damage is considered to be responsible for the new person taking damage. Xiao Qiao can pass the damage back to the character that caused her to take damage. If Xiao Qiao uses "Fantasy" and kills another character, this character does not get to draw cards until they are revived. In addition, if a character is put in this situation is revived, they draw a number of cards that is equal to the number of health points missing after being revived. Xiao Qiao has an amazing deterrent for other characters trying to damage her. She is one of the most defensive characters in the game. Xiao Qiao's "Beauty" is very helpful when she flips judgement cards. She cannot be struck by Lightning or "Lightning Strike". In addition, she has a 50% chance of avoiding Capture and a 75% chance of getting an Escape out of the Eight Trigrams. "Fantasy" can be useful when being used on Xiao Qiao's teammates. When she passes damage to a teammate with a low amount of health, they will draw a lot of cards that may help them survive or even heal. However, it should be understood that this is a risky tactic that could easily backfire if the ally does not draw any cards that can help them. Because Xiao Qiao is a defensive character, she often has to hold back during her turns to store up heart cards in her hand. Xiao Qiao is weak to hand-destruction techniques. If she does not have any heart or spade cards in her hand, she cannot pass damage. When this happens, she is usually torn apart. She is particularly susceptible to Attacks from the Ice Sword. Xiao Qiao should be reluctant to use her power on enemies with little health, as they will probably draw cards that will allow them to heal and do more during their turn. Cao Cao - Cao Cao and Xiao Qiao are an amazing pair. Cao Cao can play Barbarians or Hail of Arrows, then Xiao Qiao can pass the damage back to Cao Cao. Cao Cao can use "Evil Hero" to pick up the card again and play it immediately during the same turn. This process will continue so long as Xiao Qiao has spade or heart cards. When using this technique, it is important to keep an eye on ally's health levels. Cao Cao should be careful not to kill his loyalists. Yuan Shao - Xiao Qiao can use "Fantasy" when Yuan Shao is performing his Hail of Arrows ability to pass the damage back to him and let him draw more cards. The effect will be similar to that of the combination of Cao Cao and Xiao Qiao, but the Cao Cao combination is slightly better because Xiao Qiao cannot guarantee that Yuan Shao will have another pair of cards to replicate the cycle. In general, Yuan Shao needs to have more damage to draw more cards to ensure that the cycle continues. Guo Jia - Xiao Qiao can pass damage to Guo Jia. He draws two cards for each unit of damage that she passes to him and X cards as per her power, giving him and his team an amazing card advantage. Liu Bei/Sun Quan - When these characters are low on health, Xiao Qiao can pass them damage. Liu Bei will draw a lot of cards and he can pass them to his allies, being sure to dive Xiao Qiao more heart and spade cards. Sun Quan will draw a lot of cards to use for his "Balance of Power." Zhou Tai - When Zhou Tai is on the brink of death when using his "Refusing Death", he will draw four cards when Xiao Qiao activates "Fantasy" on him. Some of these cards may help him heal. Zhang Liao/Gan Ning/Sun Jian - These character can remove cards from Xiao Qiao's hand and leave her open. King Xiao Qiao is a good king choice. She can deflect damage to the rebels and keep herself healthy. However, you need to watch out for hand Zhang Liao and Gan Ning, as these characters are counter picks. Xiao Qiao is also a good loyalist pick. She can pass damage to the king when he is low on health. While this seems like a paradoxical strategy, he will likely draw cards that will help him survive longer. All three of the base king picks can benefit greatly from this power. Rebel Xiao Qiao can also be a good rebel. She can defect damage to the king and loyalists or rebels who are low on health. Spy Xiao Qiao is a good spy. She can keep herself alive while subtly shifting power balances to keep the teams balanced. Xiao Qiao is a great character who can play any role well. To a beginner player, she seems very overpowered. This is not the case. She has to be careful about where she passes her damage. In general, pass damage to a character with full health if they are an enemy, as they will only draw one card. If an enemy has one unit of damage, it is a toss-up whether or not passing damage to them is a good strategy. If they have two or more units of damage, it is not a good idea to pass damage to them unless they are an ally.